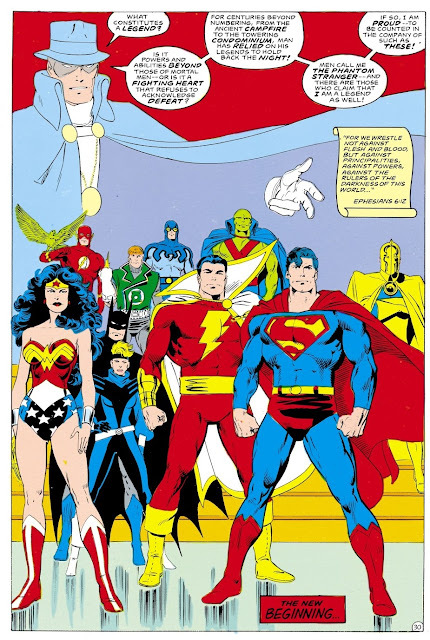 LEGENDS had begun as a follow up to Crisis on Infinite Earths. 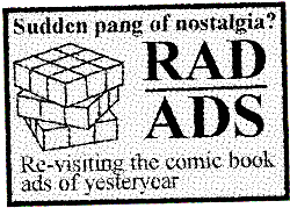 Seen mainly as a springboard for launching several new titles such as Kieth Giffen & J.M. DeMatties' run on Justice League and John Ostrander's Suicide Squad, it still stands on its own as an entertaining read. The plot is relatively straightforward, but with enough happening in each issue to make it feel like a bigger story than the page count suggests. Darksied is scheming with Glorious Godfrey on Apokolips to destroy the so-called superhero 'legends' of earth. If he does so, it will make humanity stop believing in higher ideals and be much more susceptible to being brainwashed and taken over. The Phantom Stranger shows up and makes a bet with Darksied that humanity will never turn its back on its heroes and good will never truly be snuffed out. To carry out his plans, Darksied sends Godfrey to pose as a TV preacher, G. Gordon Godfrey, and use the media to spin the public into believing that the very existence of superheroes mocks the 'common man' and that the US Government should outlaw them. 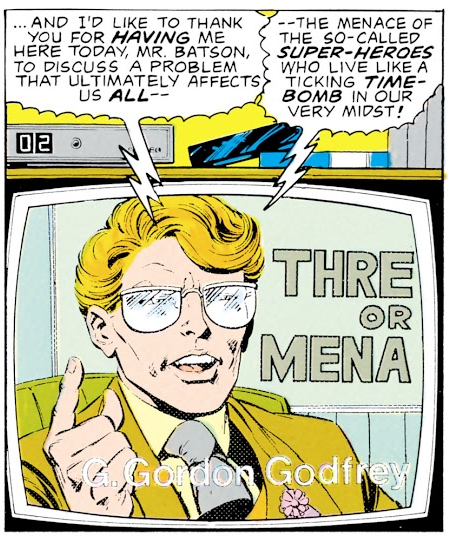 Glorious Godfrey as outspoken pundit from LEGENDS #1 (1986). Pencils by John Byrne, inks by Karl Kesel. The public is surprisingly quick to agree with this and after a few incidents of anti-superhero mob attacks, Ronald Reagan is forced to temporarily order all heroes to cease activities for the time being. 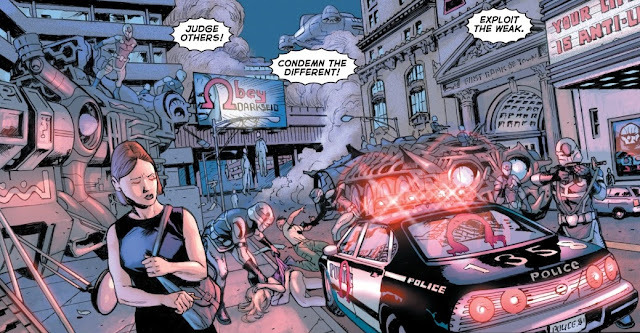 I should point out that although it’s implied that Godfrey is somehow using New God technology to hypnotise people in to following him, it’s never outright stated as such, so what we’re left with is the fact that he was able to simply get the public to attack Batman and Robin up in a department store after they just saved them all from an armed robbery. 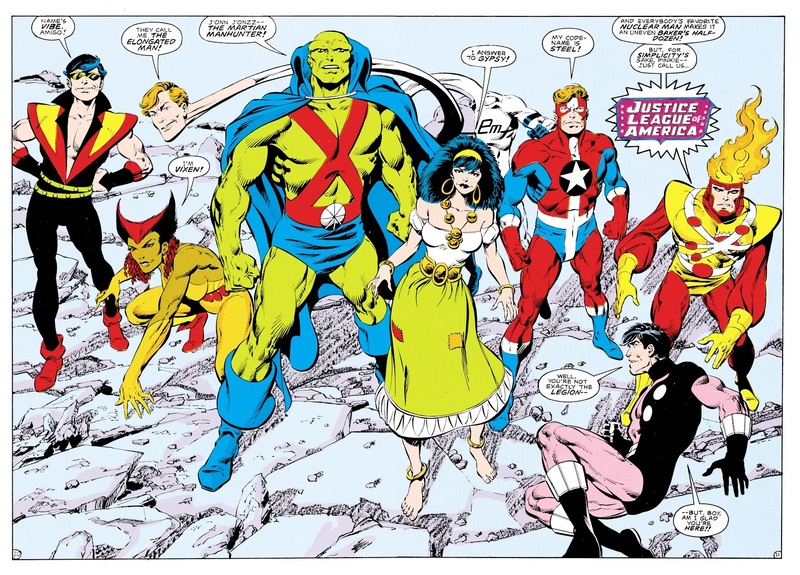 Fun fact: Five of the eight characters in this panel were co-created by Gerry Conway. 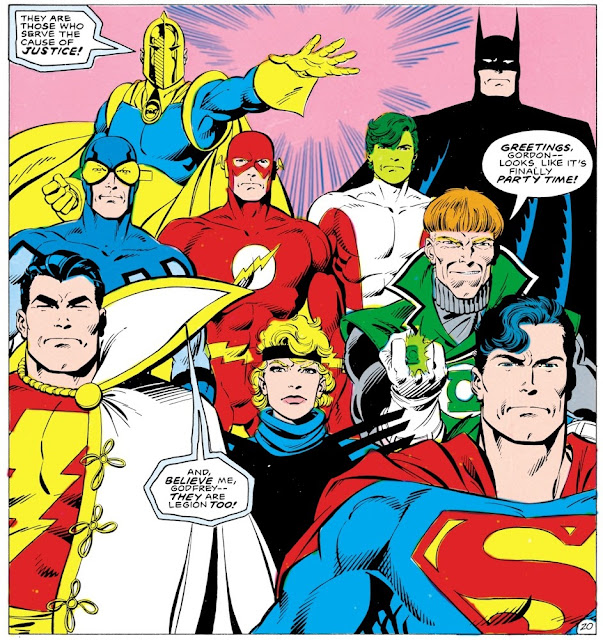 Justice League Detroit (with Firestorm and Cosmic Boy) from LEGENDS #1 (1986). Darkseid also sends out his minion Brimstone, a plasma-based skyscraping entity who fights with the Detroit-era Justice League (in a bittersweet last adventure before the end of that team), and is eventually defeated by the newly-created Suicide Squad. We get to see them in action, fighting atop Mount Rushmore. Suicide Squad vs Brimstone from LEGENDS #3 (1987). 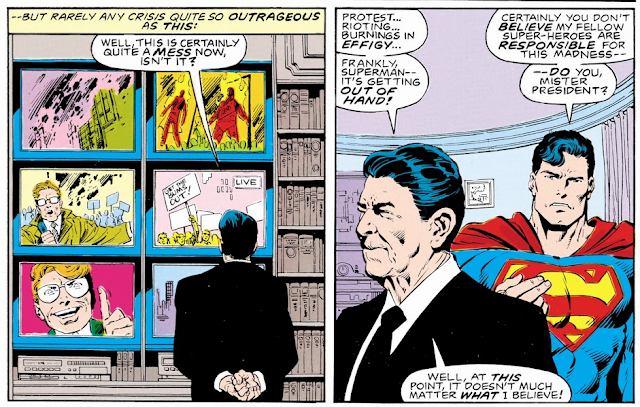 Ronald Reagan plays a background role, but it's a vital one; it’s his executive order to temporarily ban superheroes (in response to mass public unrest) that creates much of the drama of the series. Contemporary politicians in superhero comics is always a tricky issue -- since it instantly dates a comic book's longevity. It is rather interesting that he’s presented as an unknowing tool on behalf of Darkseid, the super-villain who Jack Kirby always equated with Richard Nixon. Many heroes are affected by the ban. Captain Marvel, having been tricked by a clone of Macro- Man planted to explode when struck by lightning, believes he murdered him and is afraid to use his magic word to change from Billy Batson again. Blue Beetle is shot by a cop after he stops a criminal, thinking maybe it’s time to give up crime-fighting. Guy Gardner saves an out of control plane from crashing by landing it on the freeway, and all he gets for his trouble is a bunch of angry passengers and inconvenienced motorists. Guy is atypically in control of himself in this mini, and seems like a competent, if not hot-blooded, Green Lantern. 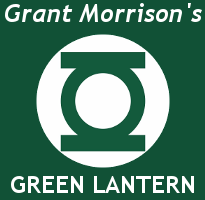 In comparison with Hal who he’s replacing, he seems like a much more exciting GL, making constructs of crazy monsters and using his power ring in clever ways like popping a small hole in an oil tank above a bad guy's head, as opposed to Hal "Giant Baseball Bat" Jordan. 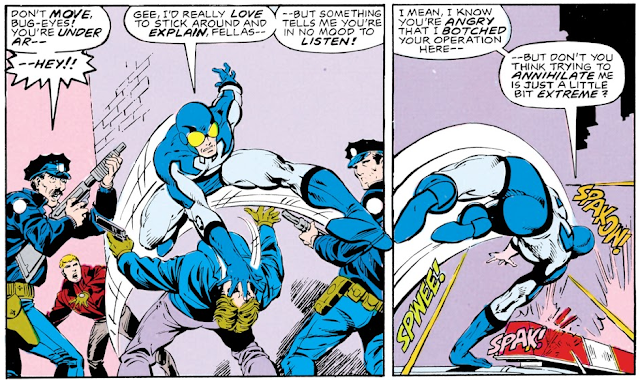 This characterization stands in contrast to the half-cocked hotshot that would be a main character in DeMatties and Giffens’s Justice League International. Dr. Fate is watching all of these event unfold and decides that it’s time to act. He gathers Superman, Batman, Flash, Beast Boy, Guy, Black Canary, Blue Beetle and Captain Marvel for the upcoming battle. It all ends with a big showdown in Washington DC with the Dr. Fate assembled heroes versus Godfrey with his human-controlled Hunger Dogs and an army of parademons. 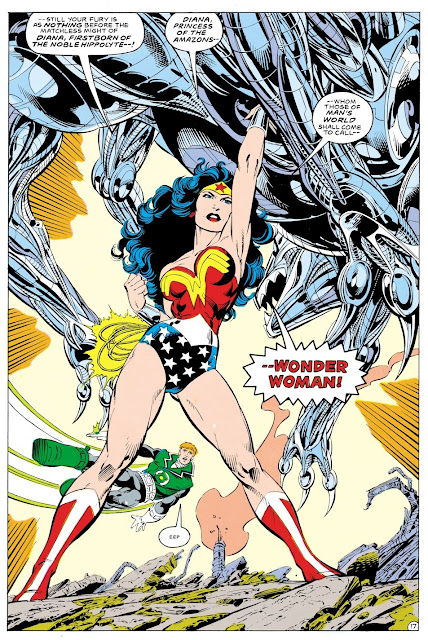 Even Wonder Woman shows up, in her first Post-Crisis appearance in 'man's world'. The dramatic debut of the NEW post-Crisis Wonder Woman in LEGENDS #6 (1987). After disposing of the mechanical hounds, Godfrey taunts the heroes that they won't dare hurt innocent, if deluded, bystanders. In the end though, it’s the innocent children who save the day by rushing to the unruly mob and telling them that the superheros are good guys after all. Godfrey strikes a child, releasing the people from his spell and turning the tide of the battle. It ends with the heroes standing around making a somewhat unrealistic speech about how although hero worship isn’t healthy, there will always be a need for people to believe in something greater than themselves. And if it wasn’t hammered enough in that this story is a religious allegory, the book ends with a quote from The Book of Ephesians. This theme -- demonstrating that the ability to influence the beliefs and values of the general public is a formidable power -- is a very common one though DC. It goes back to Jack Kirby and Darkseid’s quest for the Anti-Life Equation, all the way to the public turning on Superman in Kingdom Come (another book with heavy religious allegories), and is quite prominent in Grant Morrison's Final Crisis. Art by J.G. Jones, Carlos Pacheco, and Jesus Merino. A lot of what makes LEGENDS interesting is how, in many ways, it’s the first true BIG super team-up in the wake of the new status quo. Although Guy Gardner had been seen previously, this really feels like Guy's FIRST big public debut as the Green Lantern of Earth, and I’m sure that was the intention of the writers as they introduced Guy to a whole new crop of readership. LEGENDS is a scientific experiment that seeks to ask the question "What would the fearful and hateful humans that populate the Marvel Universe (and X-Men comics in particular) do if they where in the much more superhero-friendly DC Universe"? The answer they seem to come up with is that they would act like jerks for a while, but in the end they would revert back to their docile selves. Somewhat unfulfilling if you ask me. It should be remembered that Watchmen was coming out at the same time as this mini-series, and didn’t shy away from asking tough questions about the morality of hero worship with schmaltzy scenes with children. This book also fulfills the promise of showcasing a 'shared universe' by incorporating the heroes from the infinite earths that where saved during Crisis On Infinite Earths. Most notably, Earth-Two's Dr. Fate, Earth-Charlton's Blue Beetle, and Earth-Fawcett's Captain Marvel/Shazam. 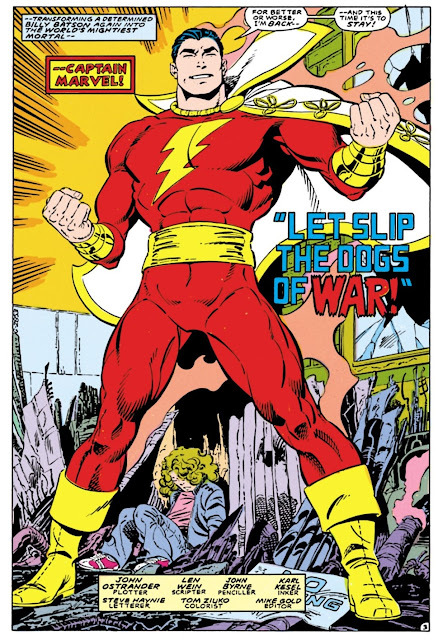 John Byrne's pencils are in top form. It’s his version of Superman straight out of the Man of Steel mini-series, right down to the sharp eyes and confident smile. It’s interesting to see him draw Captain Marvel, he even captures C.C. Beck's "squinty eyes" on him. Byrne's art totally fits for a series like this, given the time when it came out. It’s clean but not lifeless, gritty and detailed but not overly cluttered. 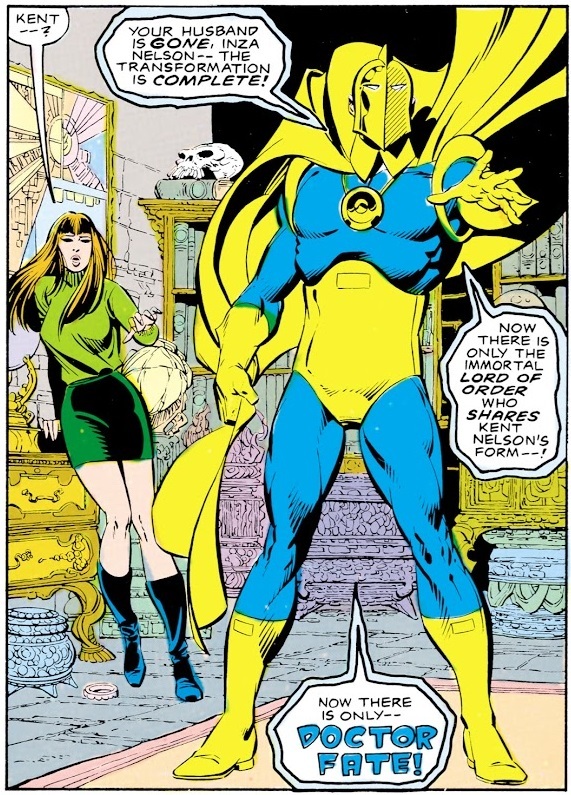 It’s hard to tell how much of the art that comes out is Byrne's pencils or Karl Kesel's inks. I’ve heard that, as more and more work would be assigned to Byrne, he would forgo drawing backgrounds and would only stick to characters. The inker would sometimes fill in the backgrounds and other details when needed. 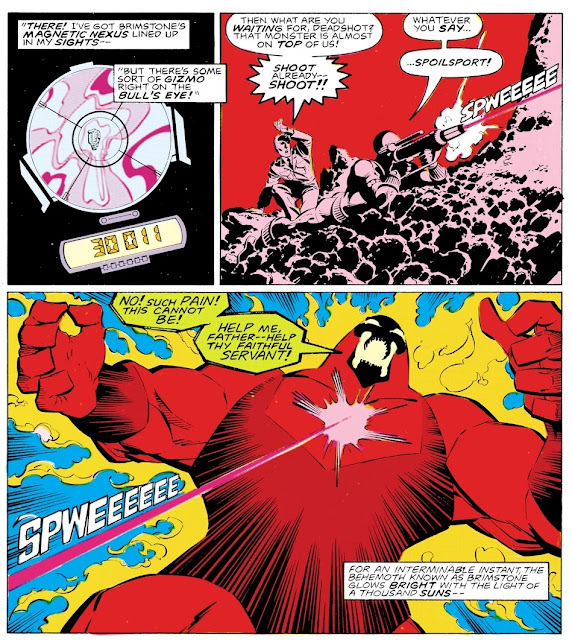 This is the case in some of the later issues of Marvel's Alpha Flight (for example 1984's Alpha Flight #13 features an eleven page dream sequence with no words and minimal backgrounds -- a sequence I DO like by the way). Ultimately, I think it’s a good mini-series that deserves reading for being a bridge from Crisis On Infinite Earths to Justice League International, but I think it’s a bit simplistic in its morality. It’s just on the edge of being a mature readers book, but then it reverts back to the world of 'Peter Pan and Tinkerbell'. The series is written by John Ostrander and Len Wein, with pencils by John Byrne and inks by Karl Kesel.